I am not that mom. You know the one I’m talking about, right? The mom who makes the most beautiful knitted sweaters without a pattern, creates elaborate quilts of their own personal design and makes every Christmas gift by hand. Not me. I have nothing against those moms at all. In fact, I admire and aspire to be like them. However, my crafts never quite become Pinterest worthy. But I still try. Why? Because I actually love making stuff. There is nothing like using your hands to create something for those that you love. Lucky for me, my kids are super impressed with everything I make. I have been wanting to make a beautiful advent calendar for years. The time always creeps up. It’s always the same: What’s that? Advent starts tomorrow? Yikes! Guess we are going to use the old snowman calendar again. It’s not a terrible calendar, but the pockets are tiny and putting anything but a penny for each kid is pretty hard. Last year I made scavenger hunts with clues to their gifts each day. It was very time-consuming and really a bit overkill. I did find something that I fell in love with. Paper stars. 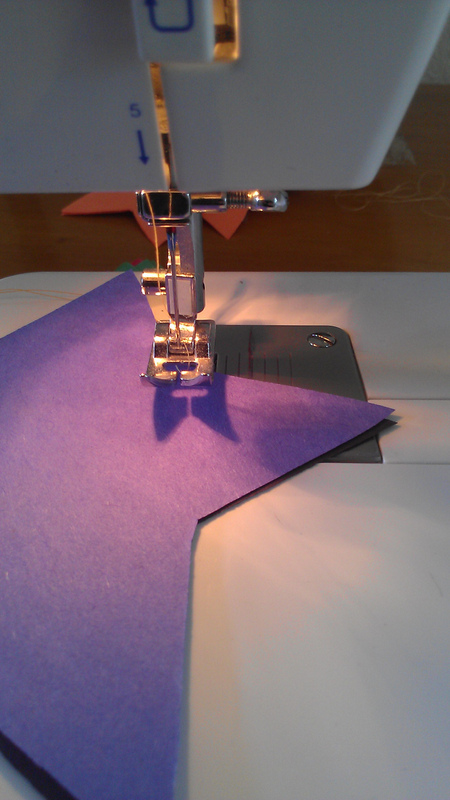 Did you know you can sew paper?? I had no clue. So I decided this was the project for me. Looks easy and beautiful. Not for me. I struggled through this project and almost gave up many times. It took me so much longer than it should have. A crafty mom could complete this in about 20 minutes. For me? About 400 hours. First, I had no brown postal paper. I thought about getting some, but I really wanted to use what I already had. So I used construction paper. The colors were…umm…not entirely Christmas. But I thought, what the heck? 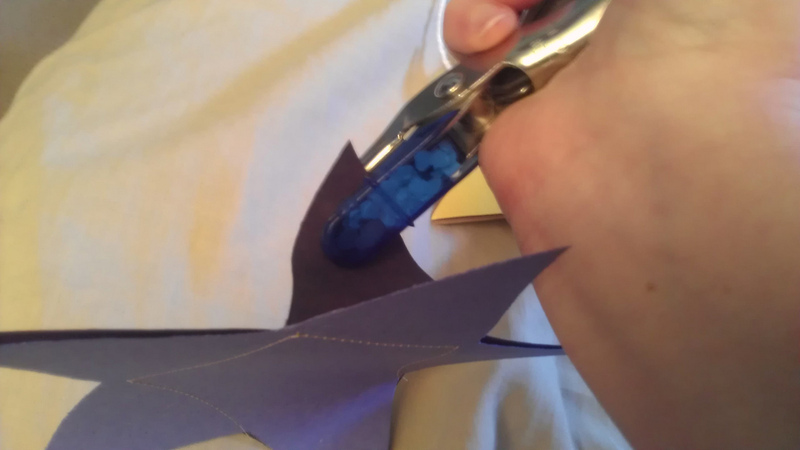 So I set out cutting the stars. After about 50 I began thinking this was a doomed project. I ended up having to do math. Not my favorite. The total number of stars was 96. After 100 hours, I had 24 star pouches for each kid. No turning back now. Then it was time to stuff them. I decided to do half the stars as “Christmas Tasks” — little pieces of paper with tasks like “make a card for someone,” “sing Christmas carols loud on the way to school” and “do something kind for someone today.” The other half of the stars would have Legos inside. Sounded easy enough. Nope. The Legos kept falling out. So I decided I had to string them up first. 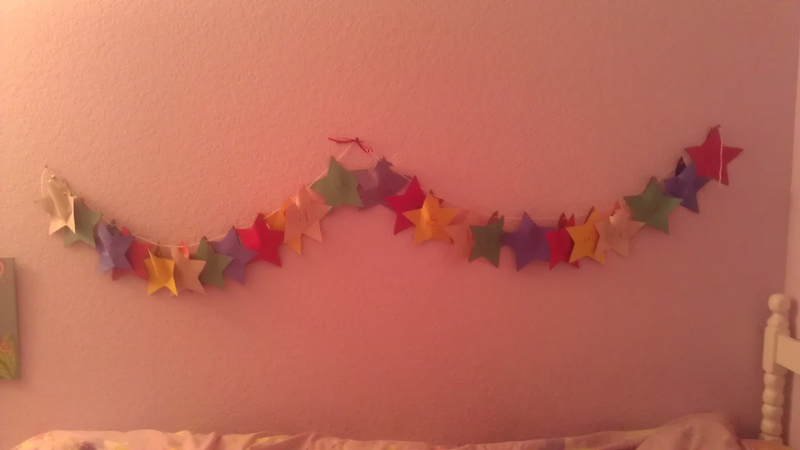 So I hole-punched the back of each star and strung them up on some leftover yarn I had. I could not fill them yet because the stars would not stay put. So I used tacks to attach them to the kids walls above their beds. It was so much bigger than I had imagined, so I had to bunch them up. Time to fill them up. I spent a fair amount of time figuring out that the Lego sets needed to be in little bags in order for them to not spill out the top. I tore two of the stars off the string while stuffing, but fixed that with a little tape. Viola! Easy as…nope. Not easy. Finally it was time to show the kids why mom had been saying, “don’t come up here I’m making something for you” for days and days. Although nobody is going to pin this project, I won. 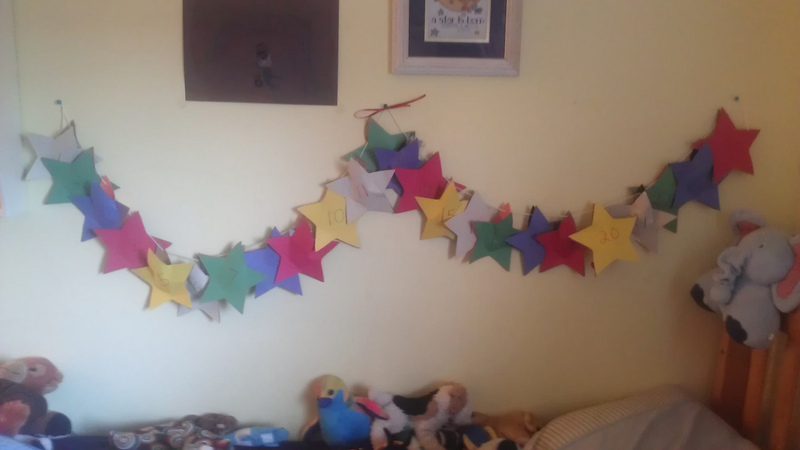 The kids are super excited to have their own advent calendar in their own rooms AND I finished it! Happy first day of Advent to you all. I’ll be taking a nap now. You are absolutely the best mommy ever!!! I am so proud of you…… you are a great mommy!